Why are so many of my favorite musical acts releasing disappointing albums this year? Wilco, P.J. 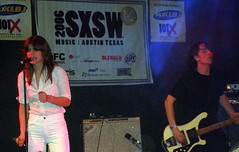 Harvey, The New Pornographers, and now The Fiery Furnaces. And I appreciate Eleanor’s shout out to the Land of Enchantment — “so said the birth chart I sent away to New Mexico for. It was made by a special commission of Navajo basketball coaches and blonde ladies” — at the end of “Automatic Husband.” About time someone acknowledged the mystic nature of Native American coaches. But somehow the CD doesn’t live up to the promise of “The Philadelphia Grand Jury.” The songs do seem to be loosely connected thematically, but the story line, if indeed there is one, quickly becomes incomprehensible. A couple of years ago, reviewing the Furnaces’ Rehearsing My Choir — the album that featured Eleanor and Matt Friedberger’s grandma Olga on lead vocals — I referred to “the secret language that family members share.” It seems here they are speaking that “secret language” in an increasingly thicker brogue. This wouldn’t bother me so much if the music were more interesting. But most of the songs here sound as if the Furnaces are tired and repeating themselves. The most noticeable new element is several spots on the album that sound like second-rate Flaming Lips outtakes. Listen to “Wicker Whatnots” and try not to think of the last couple of Lips studio records. But all in all, The Fiery Furnaces seem short on fire this time around. *Rise Above by The Dirty Projectors. Straight to the point: this is one of the strangest new albums I’ve heard in a long time. It’s a remake of songs from Black Flag’s 1981 album Damaged, considered a classic of California punk rock. But Rise Above is not your typical “tribute” album. Instead of slavishly reverent recreations of Black Flag songs, Dave Longstreth (the main Projector) filters Black Flag tunes through his own private universe. It doesn’t sound close to what normal mortals consider punk rock — except when Longstreth’s voice turns from a creepy croon to a grating scream during otherwise pretty musical passages. The first song, “What I See,” sounds like Morrissey fronting Ween, except where did those happy African guitars come from? The song that makes me laugh out loud is “Police Story.” Black Flag played it as an angry blast of protest against cops hassling kids. But the Projectors, while leaving in all the profanity, rearrange it as a brooding lament. Longstreth sounds genuinely sad as he sings, “They hate us, we hate them.” With its acoustic guitar and trumpet, it could almost be an American Music Club tune — except Mark Eitzel never sounded half as deranged. My only complaint is that my favorite Damaged song, “T.V. Party,” isn’t here. Maybe the Projectors are saving it for a warped remake of the Repo Man soundtrack.